Iowa’s magical 2015 season ended on a sour note. Their undefeated dream started to turn into a nightmare with the never-ending, game-winning drive by Michigan State in the B1G Championship Game, and ended with Christian McCaffrey trampling all over them in Pasadena at the Rose Bowl. Thanks in part to a comfortable schedule and the return of some of their most important players on both sides of the ball, Iowa fans can have hope for another great run in 2016 with a possibility of a happier ending. Along with JT Barrett, CJ Beathard is probably the best Quarterback in the B1G. He loses 4 of his top 5 targets from last year, including big-play WR Tevaun Smith (17.6 yds/catch). The Hawkeyes do retain Beathard’s favorite WR Matt Vandeberg (65 rec for 703 yds in ’15), and TE George Kittle, who was named the NCAA’s best Tight End. Their offensive line does lose two All-B1G performers, who combined for 86 career starts, but they return five offensive linemen who started at least two games in 2015. The Hawkeyes should have a strong backfield, despite the loss of Jordan Canzeri, with the return of LeShun Daniels (646 yds 8 TDs), Akrum Wadley (6.0 yds/carry 7 TDs), and Derrick Mitchell (6.2 yds/carry). The one weak spot for Iowa’s defense will be in the pass rush thanks to the loss of both of their starting Defensive Ends: Drew Ott, and Nate Meier. Ott’s injury in ’15 really hurt the defense as they gave up 4.4 yds/play with him in the lineup, and 5.5 yds/play without him (stats via SB Nation). Other than those two losses, most of the gang is back together again as the defense returns 7 starters and 72% of its snaps from 2015. The biggest news of the offseason for Iowa fans came when CB Desmond King announced he would be coming back to Iowa City for his senior season despite being a 1st-round caliber draft prospect. Desmond King will also be very important to Iowa’s Special Teams unit as both a kick and punt returner (Avg 24.4 yds/KR, 14.2 yds/PR). The Hawkeyes do lose a key piece of their team in Kicker Marshall Koehn who was incredibly important to Iowa’s success in close games in 2015, including a 57 yard game-winning FG against Pittsburgh. Iowa received a lot of criticism from the national media for a weak schedule in 2015. I suspect that criticism to be loud again in 2016 as Kirk Ferentz has called up Miami (Ohio), and FCS champions North Dakota State to join their in-state rival, Iowa State, on their non-conference schedule. The Bison are a tough opponent and won’t be huge underdogs in Kinnick, but Iowa won’t receive much credit for winning any game against an FCS opponent at home. The Hawkeyes avoid Ohio State and Michigan State on their B1G schedules for the second straight season, and they get the Michigan Fightin’ Harbaughs to come to Iowa City on a Saturday night. They get to face 3 out of the 4 other B1G West contenders at home (Northwestern, Wisconsin, Nebraska), but they do travel to Minneapolis to play a Minnesota team that almost beat them in Kinnick last season. The only other relatively tough game on the schedule will be a trip to Penn State to play James Franklin’s Nittany Lions in November. Iowa could be allowed to lose 2 or 3 of those games listed above and still be playing Nebraska for the right to play in the B1G Championship on the day after Thanksgiving. That’s exactly how I see the Hawkeyes’ 2016 season shaking out. Other than replacing a few key players on the Offensive and Defensive Lines, which are historically very stout at Iowa, a major concern would be Kirk Ferentz’s track record with handling high expectations. 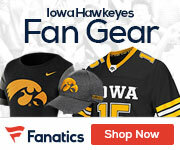 The last season the Hawkeyes won 11+ games was 2009, which was a memorable season in which Iowa ended the season with an Orange Bowl victory over Georgia Tech. In 2010 the Hawkeyes were ranked #9 in the nation heading into the year, and they returned Iowa City legend QB Ricky Stanzi along with many other stars and future NFL draft picks. That season ended in heartbreak with an 8-5 record. They lost those 5 games by a combined 15 points. Will we see history repeat itself in 2016? Will the balls that bounced the Hawkeyes’ way in 2015 bounce the other way? The expectations are high again in Iowa City, which brings a certain level of anxiety among the fan base. I don’t see another 8-5 debacle, but I think Iowa fans should be very happy with a 9-2 or 8-3 record heading into the Nebraska game where they’ll hope Tommy Armstrong Jr. will repeat his 0 TD/4 INT performance of 2015 to send the Hawkeyes to the B1G Championship Game for the second straight year.